This is our most popular event of the year. Two Full days learn, test & correct techniques - with feedback from 20 top Expert Coaches! Ride FASTER & LOWER RISK at the same time! Testimonial: "I took the two day school in June and the next time I came to the racetrack I not only dropped 5 seconds, but I also eliminated all the scary "moments" that I frequently had on the track. Best of all, I know where to find more time....thanks so much!" - B.T. Day 1 - Tuition for Basic Students includes our school guidebook "Basic Road racing" by Jerry Wood, classroom instruction (discussing bike preparation, riding techniques, flags, rules and track survival) and most important plenty of riding time! Following the classroom you will be introduced to the racetrack while riding in small groups, each led by an expert instructor. The balance of the day will be rotating practice sessions where you can ride at your own pace and practice what you have learned. There will be instructors available at all times to help with any questions you may have. At the culmination of the day, all basic students will compete in a simulated race start and be 100% certified for your racing license. 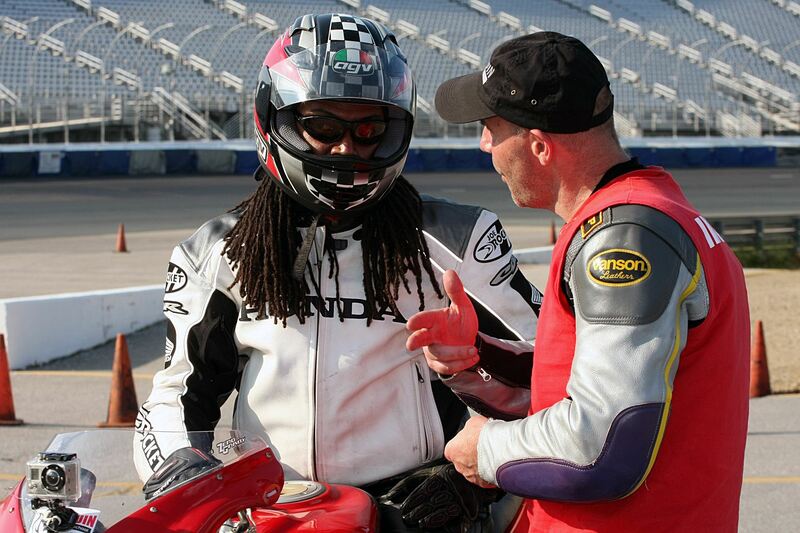 Day 1 - Track Experience students will not only get abundant track time but will also get the benefit of personalized instruction and feedback from #1 LRRS rider Scott Greenwood. Scott will lay the foundation for making serious strides in your riding through a detailed breakdown of track strategy and an emphasis on critical rider input techniques. Ample time is given for personalized questions and answers, and each student will be paired up with an instructor for some 1 on 1 time in the afternoon. This day will focus 100% on getting track time and improving your riding technique. Our morning track walk gets raves from past participants who tell us that they have never made more progress before! After the morning session, there is tons of track time. Our expert instructors will guide you around the track, emphasizing the points of the morning track walk. You will be observed and critiqued (at your option) in the afternoon to give each student riding tips that are specific to him or her. All students have the option all day to tap the resources of our experienced staff for 1 on 1 attention. Most of our advanced instructors are expert class champions and can help you with bike setup, starts, braking, cornering, race lines, and more. You gather enough information in these 2 days to keep you thinking for months. Days 1 & 2 - If you have track experience and want to get to the next level, this course is for you! We pack in 2 days of intense training that drops our average student's lap times by nearly 2 seconds. All levels - from new racer to pro will feel comfortable here. We cover anything and everything you need to know, and focus on individual attention and critique . Not only do you get the riding secrets of NHMS from the most experienced staff in the nation, but you get someone watching YOU, helping YOU to put it into use. If you have questions, we will get you the answer. We cover braking, cornering, body inputs, drives, slides, starts, bike setup, passing, race strategy and more.... You can't spend money anywhere on our bike that will drop your lap times like we can.